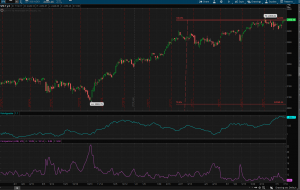 Market snapshot for 7/14/2017: SPX hitting resistance while risk appetite and perception are potentially nearing a reversal. Sometimes it helps to look at more than one metric when analyzing future market direction. It is still hard to make any short term predictions, but SPX does seem to be hitting resistance. This trend could go either way, but VIX and my extended risk appetite index seem to be doing a u-turn. This could suggest at least a short term decline in SPX.